← How to convert PX3 to PS and set page orientation? 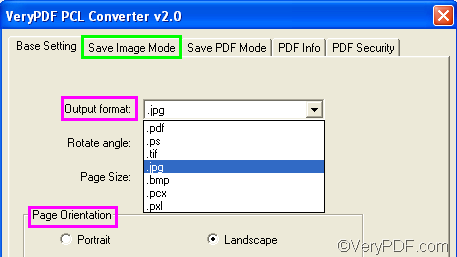 With VeryPDF PCL Converter, you can quickly convert PX3 to JPG and set page orientation. Furthermore, you can set color depth and resolution for the result image files. To download VeryPDF PCL Converter, please click here. After installing the product on your computer, you can take the following four steps to convert PX3 to JPG and set page orientation. Firstly, please run VeryPDF PCL Converter. On the desktop, please find the icon VeryPDF PCL Converter, and double click on it. Then the interface will appear on the screen. Secondly, please go to input PX3 files by doing as follows: click the Add File(s) button on the interface. > In the dialog box that pops out, please select the PX3 files, and click Open. The dialog box disappears and these px3 files are displayed on the main interface. To set the output format, please specify .jpg as the output format in the Output format combo box. To set page orientation, for example, to change the default page orientation Portrait, please click the radio button before Landscape under Page Orientation. To set other options like color depth, please click the Save Image Mode tab to switch to the corresponding tab control and set color depth there. Click OK after setting all the options. Fourthly, you need to select a folder to store the output files and start the task. Please click Start on the main interface to open the Browse for Folder dialog box, > select a folder in the dialog box and click OK. The dialog box disappears from the desktop, and you can view the progressing in conversion on the main interface. Convert prn to pxl and set page size via command line? How to convert prn to postscript via command line? This entry was posted in VeryPDF Blog and tagged px3 to jpg, set page orientation. Bookmark the permalink.